JAKARTA - Ami Kondo had already established her status as one of the elite judoka in her weight class in the world. But now she is about to be known as one who falls short in the clutch. The 23-year-old was hoping to snap a streak of disappointing results in major tournaments. But she was unable to do so at the Asian Games on Wednesday as she took a stunning loss to South Korea’s Jeong Bo-kyeong in the golden score period of the 48-kg final. 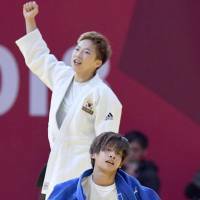 For Japanese judoka, anything short of a gold medal is a disappointment. Kondo could do nothing to hide her disappointment as she sobbed after the match, unable to shed her jacket and put on the team jersey to attend the medal ceremony. She looked to seal the deal against Jeong when she locked her opponent in an arm bar about 30 seconds into the golden score period. While waiting backstage for the medal ceremony, Jeong could be seen holding her left arm, her face distorted with pain. Kondo looked unhurt, but their expressions did not reflect the colors of their medals. The two appeared to be in friendly conversation just before reappearing in the arena for the podium ceremony. Kondo has collected numerous medals at international tourneys, including Grand Slam circuit events. But when it comes down to global contests, she has not been able to meet her phenomenal potential. Although the Nagoya native captured a 48-kg gold medal at the 2014 world championships in Chelyabinsk, Russia when she was 19, Kondo ended up with bronze at the 2016 Rio de Janeiro Olympics as well as the 2015 and 2017 world championships. In a sense, Kondo was not supposed to be competing at the Asiad, where Japan did not send its full squad as it prepares for September’s world championships in Baku. She had suffered a severe knee injury in February and failed to punch a ticket for Baku in the spring. Kondo is still very young and can compete for a spot in the 2020 Tokyo Olympics. Her strongest display may come as she demonstrates how she will bounce back from Wednesday’s bitter experience.